You can store log events with Ozeki SMS Gateway for every incoming and outgoing message from your database. It is a useful idea to transform SQL queries to produce various log reports. 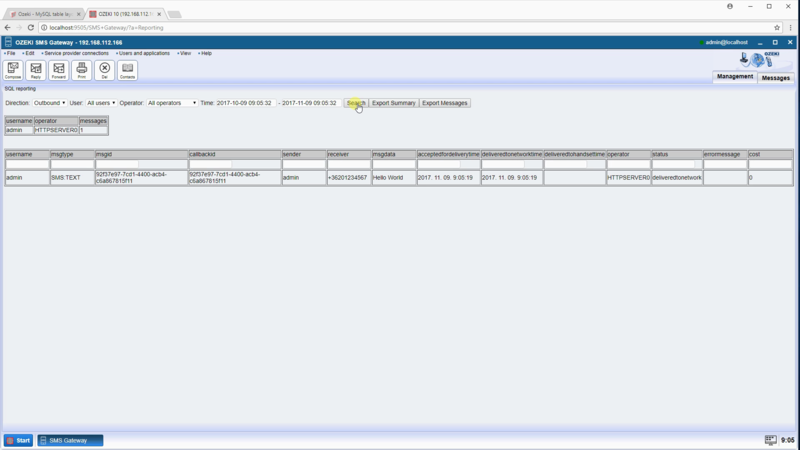 Customize your log reports for every database connection using an ODBC or OleDb driver. You can specify the SQL logging option with a correct database connection string, which creates a connection to your database with an ODBC or OleDb driver. Then specify the SQL statements to store message traffic information on your database server. These statements can contain keywords as well, which keyword will be replaced just before executing each SQL statement. For example you can INSERT a new row generated from a received message. 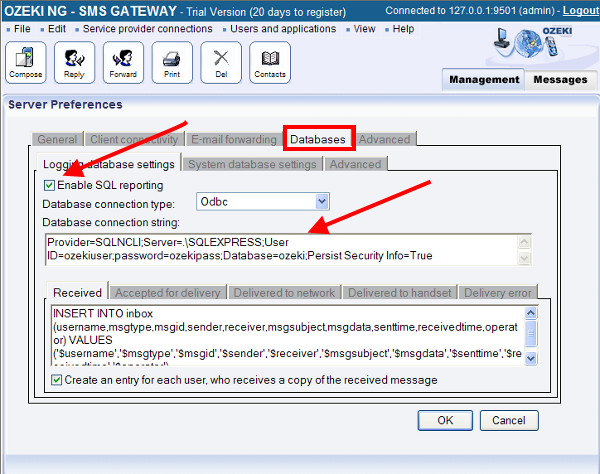 Enable logging your SQL queries by clicking 'Edit/Server preferences' from the top menu of Ozeki SMS Gateway. On the new page please select the 'Databases' tabpage and 'Logging database settings' sub-tabpage (Figure 1). Tick 'Enable SQL reporting' to enable SQL logs and do not forget to add the connection string for your database driver. 'Log SQL commands into eventlog' should be ticked as default, but it is advised to check it (Figure 2). If you enable this option, the executed SQL statements will be written into the event log during reporting. Here you can read more. You can CREATE the tables for your SQL database if they are not yet created. You can find detailed descriptions for creating MySQL, Oracle or MSSQL table layouts. CREATE TABLE statements await you on the following page.